Notifying your site visitors of replies to their comments on your posts is a super way to keep the conversation going. 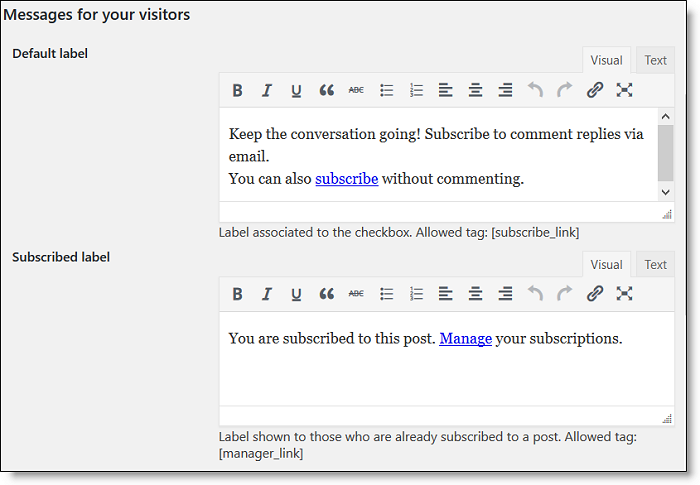 The Subscribe to Comments Reloaded plugin is one of the best to help you make it easy for your visitors to subscribe to comments and help you manage comments on all of your posts. Discover the feature list and recommended settings I use in this quick tutorial with screenshots. Update: There is a trick to setting the Advanced default subscription type. See the Comment Form section of the written tutorial below for more. Is this the right plugin for my site? Before you install Subscribe to Comments Reloaded, have a look at my in-depth comparison of all currently supported comment reply notification plugins. I advise that this plugin is best suited for sites that get 15 or less comments per post. Otherwise, you’re subscribers might get overwhelmed and elect to turn off all comment reply notifications. Light on site resources, as it only creates one database table and no extra files. Rich text editors for custom styling/wording the form, emails, and subscription management pages. If you were using any type of subscribe to comments plugin prior to installing this one, it will automatically import those subscribers. 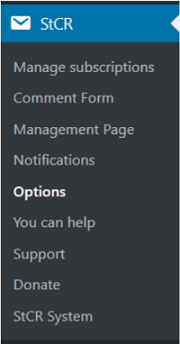 Once activated, it creates its own tab in the admin sidebar. This makes it super easy to jump straight to all control sections of the plugin. You’ll want to visit the Options section first. Once you’re in any of the plugin’s admin pages, you’ll find those same tab selections at the top of the page. Most of the default settings will work just fine. But read on to see ones that you may want to tweak. The first 2 options deal with plugin defaults that you want to set as shown. You’ll want to change the Autopurge requests to whatever works best for the number of comments you get a day. If you get 15 or fewer comments a day, then a setting of 30 days is fine. If you get more than 15 a day, then you’ll want to lower the number to purge more often, say 14, so it will purge every two weeks. They first two should all be set to No. Subscribe Authors – As an author, you already get notifications for all comments and replies left on your posts. If you want to turn this feature on, then you’ll likely want to turn WordPress’ default notifications off, else you’ll double up on all notifications. Enable HTML emails – if you hear from subscribers that your emails are having trouble getting through, you may want to try plain text emails. They are not as pretty, but they will be received by most email clients. Process trackbacks – this should always be turned off, and is part of your site security. Track all subscriptions – turn this off, you’ll be overwhelmed with notifications otherwise. Let admin subscribe – again, I advise turning this off since you’ll already receive notifications of all comments and replies via the WordPress default settings. BCC admin on Notifications – if you have multiple authors on your site, you may want to turn this on so that you, as the admin, receive comment reply notifications as well as the author. Enable Font Awesome – turn this on if you want to use the special fonts that are available in the plugin’s style sheet. It does create one more outside request, which can affect page load speed. Most themes have pretty styling of their own for Google fonts and don’t need this option on. StCR Unique Key – a key should already have been generated upon plugin activation. If not, click the orange Generate button. This will give extra encryption to notification emails. Save Changes – when you are finished with all of your settings, click the green Save Changes button. One of the best things about this plugin is that you can configure everything your site visitor sees. And, it includes rich text editors to make it easy for you to style. Update: To see the Advanced default drop-down and choose what subscription type you would like to use by default, after you click Yes on Advanced subscription, save your settings. Then the Advanced default drop-down will be available to you. 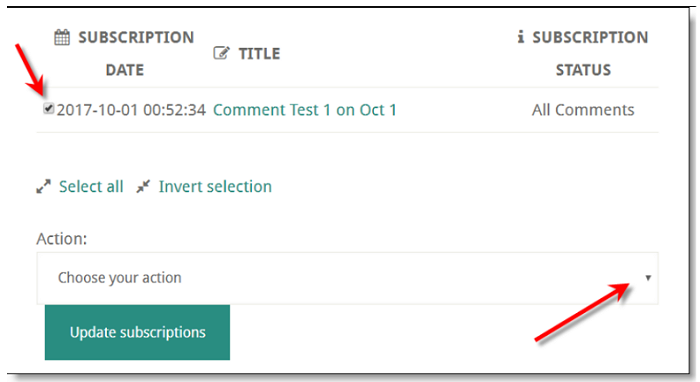 Default Checkbox Value – if you intend to allow subscribers a choice in the next section of subscribing to all comments on this post, or just to replies on their comments on this post, you’ll need to set the default value. I suggest setting it to All new comments. If that gets to be too much, they can always manage their subscription themselves. Advanced subscription – This allows subscribers to change their subscription setting on a per post basis on their Manage Subscription page, which you’ll see in a moment. Advanced default – This is pretty much the same thing as the Default Checkbox Value, so set it the same. Custom HTML – you can customize the message prior to the subscription checkbox. Be sure to use the tags (in brackets) to pull in the proper fields and labels. I would leave this at the default. In all, there are 4 possible messages for subscribers and each has its own rich text editor so you can customize the message. These appear on the post itself, in the area of the checkbox. Here’s how the first one appears on BlogAid. If you customize them, be sure to leave the links to manage subscriptions. Scroll to the bottom of the page and click the green Save Changes button when you are finished. One of the things I enjoy most about this plugin is the ability to customize the messages the visitor receives. You can also change the from/to info of the email itself. Sender name – you’ll want to populate with either your site name or your personal name, so the subscriber will instantly recognize who it is from. Sender email address – You’ll want to set this to an address that you’re okay making public, as you never know who is leaving comments, and they’ll see this address. Reply To – if you leave this blank, it will default to the Sender email address above. 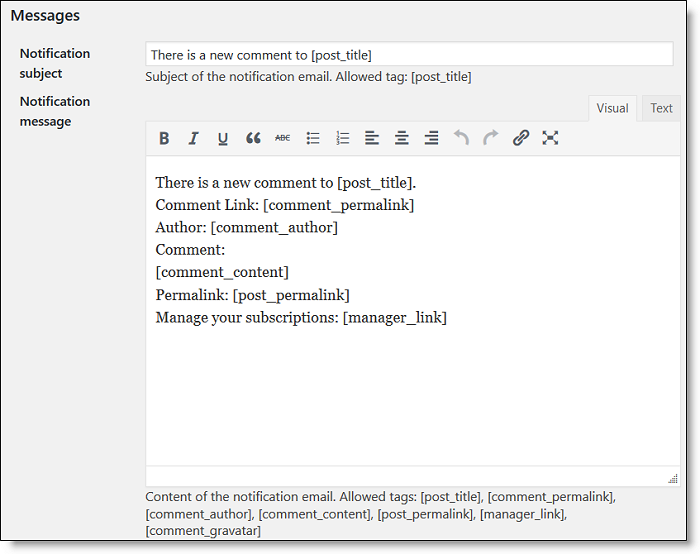 You can customize everything about the subscription notification that your comment subscribers receive. Notification subject – the default setting, including the tag with the post’s title, is good as is. I don’t want to get too cute with this. You don’t want it to trigger a spam filter in their email client and you want them to be excited that there is a new comment, and to encourage them to open the email. Notification message – the default settings here are good, including all of the tags to auto-populate the message. If most of your commenters have a Gravatar account that shows their profile image, you could even include that, to personalize the message more. And, you may want to consider including your social follow links in this message as well, or a link to optin to your newsletter. Just don’t overdo it, especially if you have a lot of comments and replies. That might seem pushy or too much info. What they are really interested in is the on-going conversation. That’s why they subscribed to the comments. Double check message – if you turned on double optin confirmation. One click unsubscribe – in case they want to unsubscribe from comments on that post. When a subscriber clicks on the Manage link in their email, here’s what they see first on your site. From there, they can click the link to go to their personal management page, which you’ll see in a moment. Once you’re finished with all settings, scroll to the bottom and click the green Save Changes button. Each comment subscriber can self-manage their subscriptions. Once they click on the link shown in the last section, they are taken to their own subscriptions via a Manage Subscriptions page that is populated with the posts they are subscribed to. This is the only part of this plugin that I don’t like because it is not intuitive. You have to check the box, which is too small, and then select the action. The instructions are above it, but nobody reads those. The Management Page settings tab allows you to customize what they see on that page. Virtual Management – if you have a super old theme and it can’t handle a virtual page being created by the plugin, then set this to Disabled. Page Title – Give your page a title, and don’t get to cute with it. Keep it simple. Maybe Manage Your Subscriptions would help personalize it a bit. Management URL – this is the URL of the virtual page that will be created by the plugin. It doesn’t actually exist as a page in your pages list, so you need to customize it here. Custom Head meta – you most definitely don’t need bots indexing this page. So, tell those bots to noindex, nofollow this page. I have all of the defaults to be sufficient. When you have finished with your changes, scroll to the bottom and click the green Save Changes button. One of the other nice features I like about this plugin that few others have is a way for the site admin to manage comment subscribers. These allow the admin to change a subscriber’s email address so that they can stay subscribed under the new one. And, admins can add people as a subscriber to certain post. You will need the post ID to do this (like p=345). Or, they can be switched from subscribing to all comments to just replies on their comments. These management tools are especially helpful for folks who can’t figure out the Manage Subscriptions page. Below that is a handy search function that will allow an admin to search for a particular subscriber by email, status, or even the post ID and make changes to them. Overall, Subscribe to Comment Reloaded is a very powerful plugin that keeps conversations alive on your site. With its ample settings and multiple customization features, you can get the right look and messages to your comment subscribers. And, the admin control is superior to most other comment reply notification plugins. Thanks so much for your review of this plugin and for the suggestions! Thanks. One thing…we added this to our ecommerce site. The only issue is that it wants to add a subscribe option to our product reviews on each product. Any idea how to suppress that? I don’t see any option where you choose to not have the form appear on specific post or pages. Brian, it should only add the form where you have comments open. Might consider turning them off for specific taxonomy types, like products. Otherwise, you’ll want to contact the plugin dev to see if he can help with that.